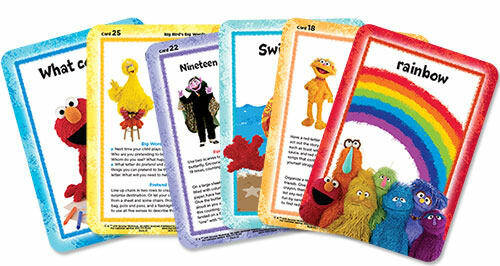 Every Learning Kit in the Elmo’s Learning Adventures program focuses on one or more essential school-readiness skills. These nine skills, or themes, have been identified through research by the early childhood experts from Sesame Street. All of the materials in the Kits—the storybook, the activity book, and the activity cards—work together to reinforce the learning themes and help children acquire the skills they need to be successful in school. Elmo's Learning Adventure is parent approved! Elmo's Learning Adventure was the right choice for my daughter before she started school. It was a great way for her to learn basic words and phrases while improving her problem-solving skills. Nothing gets my daughter more excited than receiving her monthly package from Elmo's Learning Adventure. I'd highly recommend this program to any parent who wants to give their child a head start on learning to read. My son loved learning his ABCs, numbers and colors along with Elmo and the other characters. Once my newborn daughter is a few years older, this is definitely the program we'll use to get her ready for school. We're so sure that our program will delight your child that your satisfaction is 100% guaranteed. If your're not totally satisfied, you may return any book package for a full refund of the purchase price and cancel your subscription at any time - no questions asked! Please provide the best mobile phone number to reach you using our autodialer regarding your subscription or to make you aware of special offers. Please keep me informed of other great offers from Early Moments. Please let me know about offers from Early Moments partners you think might interest me. Today we'll send your Welcome Package. Then, about every 3 weeks (up to 17 times a year) we'll select a new set of Learning Kits to send you for just $7.99 per kit plus applicable shipping and handling. You will also receive up to 4 more seasonal packages a year which include jumbo sized Elmo books and related items like a calendar. Those special packages will cost between $15 and $25 each plus applicable shipping and handling. We'll always send you an email notice before shipping any packages and you can always cancel a shipment by simply going into your online account or contacting us within 10 days of your receipt of the email. By clicking continue you authorize that we can charge the account you provided on the date of shipment. Of course you can cancel at any time. Orders are subject to applicable sales tax. You may cancel your subscription at any time for any reason by logging on to your dashboard at EarlyMoments.com, by emailing us at CustomerCare@EarlyMoments.com, by writing at the address below or by calling Customer Care at 1 (800) 353-3140 Monday to Friday 9am-5pm EST. Your satisfaction is guaranteed! If you are not completely satisfied with any book package, simply return it within 30 days of receipt. Please include your original invoice along with a note letting us know whether or not you wish to cancel your subscription. We will automatically refund the price of the books to the original payment method you used. At Early Moments there is never a purchase commitment. You may cancel at any time for any reason. This offer may be withdrawn at any time. Limit: one subscription per household. Must be 18 years of age or older to order. Applicable sales tax will be applied. All applications to subscribe to the Elmo’s Learning Adventure are subject to review. We reserve the right to request additional information, to reject any application, or to cancel any subscription. We reserve the right to alter or end this offer at any time. If you ever do not receive your notice about your shipment giving you 10 days to cancel that shipment contact us and we will provide return shipment. All books are subject to availability. ONLINE: EarlyMoments.com You can manage all aspects of your subscription 24/7 through the dashboard at Earlymoments.com. Select Log In from the menu in the upper right corner. PHONE: 1 (800) 353-3140 Monday to Friday 9am-5pm EST Please feel free to leave us a voicemail if you are unable to reach a live agent and we will return your call as soon as possible. EMAIL: CustomerCare@EarlyMoments.com Email us 24/7 and we will get back to you as soon as we are able. Please allow at least 24 business hours for a response. *YES! Please send 2 additional Learning Adventure Kits for $7.99 - That's 50% off our regular price! We want you to be 100% satisfied with every product we offer you and your family. If for any reason you are not, just let us know. At Early Moments TM there is never a purchase commitment. After your welcome package, we’ll auto-enroll you to a convenient subscription, in which you'll continue to receive new learning kits every three weeks and a seasonal package 4 times a year, or at a frequency that you choose, for $19.97. You may put your subscription on hold, or cancel at any time through your account dashboard or by contacting our customer care team. Why do you need to know my child’s age? 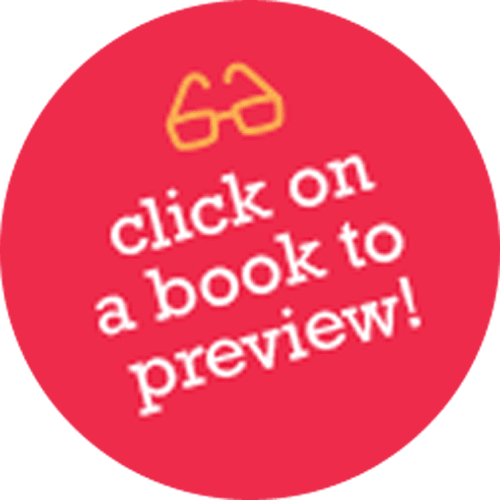 What makes us different from all other book programs is our variety of books and book formats, and our ability to ship books that are specifically matched to your child’s age. We’ve spent more than 40 years researching how to do this and it is how we ensure that both you and your child will enjoy, be engaged by, and learn from every package we send. Why do you need to know my child’s name and gender? Actually, we don’t! We ask for your child’s name and gender just so that we can personalize all of our communications to you. If you prefer not to provide this information, it will not impact the quality of your experience as an Early Moments customer. What makes the Elmo book subscription educational? The curriculum upon which Elmo’s Learning Adventures is based is the result of more than 40 years of extensive field testing by a team of early childhood experts from Sesame Street’s Research Division. In 2012, veteran kids’ book authors and editors combined forces with Sesame Street’s team of early childhood experts to create an engaging and educational reading experience for toddlers and preschoolers that would address nine essential learning skills. They called this new school-readiness program Elmo’s Learning Adventures. Who are the education experts behind the Elmo’s Learning Adventures book subscription? Leading the team of educational researchers who advised and guided the development of the Elmo book subscription was Rosemarie Truglio, Ph.D. As Sr. Vice President of Education and Research, Dr. Truglio oversees all educational research pertaining to the development of Sesame Street content, including Elmo’s Learning Adventures. Prior to joining Sesame Workshop, Dr. Truglio was an Assistant Professor of Communication and Education at Teachers College, Columbia University. Through her research, she investigated the effects of television on the cognitive and social development of children and adolescents. She has written numerous articles appearing in child and developmental psychology journals; presented her work at national and international conferences; conducted media literacy workshops, and has appeared on numerous broadcast, cable, and radio network news and talk programs. Dr. Truglio received her Ph.D. in Developmental and Child Psychology from the University of Kansas, and her B.A in Psychology from Douglass College, Rutgers University. What research went into creating the Elmo book subscription? 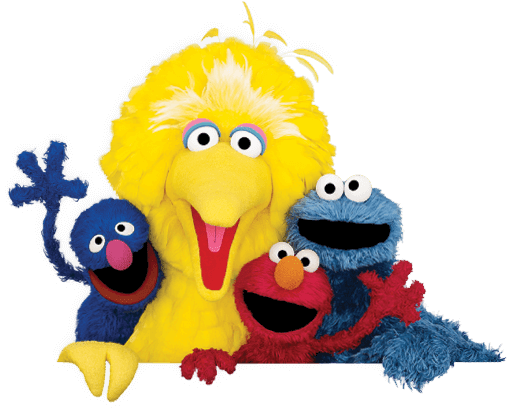 The early childhood experts of Sesame Street’s Research Division conduct basic and applied research through ongoing field testing with preschoolers and their families. The results of those studies inform production and creative decisions for how to enhance both the entertaining and educational components of Sesame Street and its published products, like Elmo’s Learning Adventures. 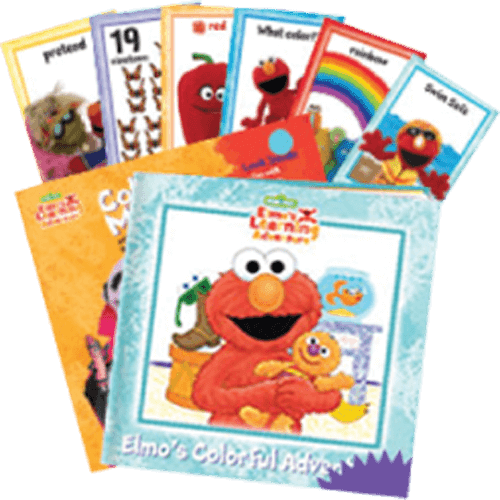 To create the Elmo storybooks, the editorial team at Sesame Street scoured their 40-year collection of thousands of Sesame Street books and identified those that supported each of the nine Elmo’s Learning Adventures educational themes. From that list, only the best of the best were considered as possible candidates to be included in the subscription. In some cases, essential curriculum holes needed to be filled, so the team created exclusive storybook editions just for the book subscription. Draw a picture of their favorite party treat for Elmo and his mommy. Practice writing the letter P at a pajama party with Cookie Monster. How to make party guests who don’t know each other feel comfortable and have fun. What to say if you open a birthday gift you already have. How to make friends at someone else’s party when you don’t know anyone. How long has Sesame Street and the Elmo Book Club been around? Sesame Street the TV program started in 1969 and is in its 45th season as of the spring of 2015. Season 46 will debut in the fall of 2015. Elmo's Learning Adventure the book program launched in 2012. How do the different materials in the Elmo Learning Kits work together? 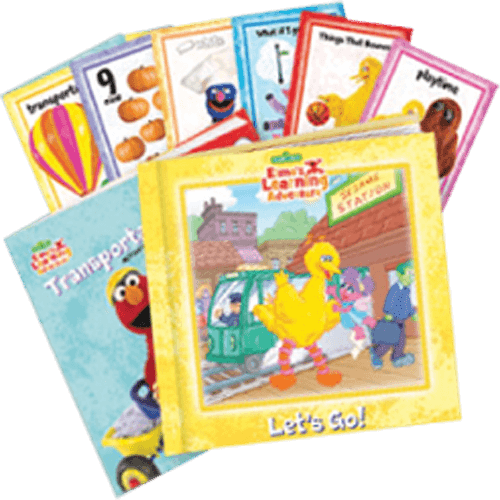 Every item in the Elmo book subscription is organized by the nine learning buckets and by individual book theme as it relates to one of those. The learning experts at Sesame Street first identified those buckets then chose books that supported them. A related theme was selected for the activity book–one that tied in directly with an element of the storybook, either because of its overarching theme or a detail within the story. Finally, a key concept related to each learning bucket was picked, with the input from Sesame Street’s expert Research team. The concepts were selected because they were words or ideas that appeared in the storybook or were a natural extension of its theme. In many cases, the book subscription creators painstakingly adapted the original text of the story so that it supported that activity card more energetically. For instance, we ensured that the word feature on the activity card was given prominence within the book and its meaning could be understood within the context of the story. What are the different learning themes in the Elmo Book Club? 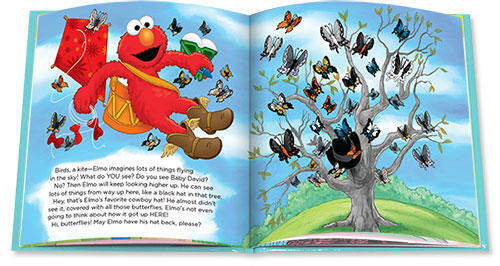 Every Learning Kit in the Elmo’s Learning Adventures program focuses on one or more essential school-readiness skills. These nine skills, or themes, have been identified through research by the early childhood experts from Sesame Street. All of the materials in the Kits—the storybook, the activity book, and the activity cards—work together to reinforce the learning themes and help children, ages 2 to 5, acquire the skills they need to be successful in school. 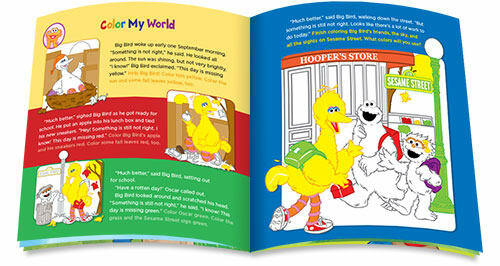 Big Bird's Big Words helps develop and strengthen your child's vocabulary. Letter of the Day introduces reading and writing fundamentals. Count Me In develops skills in number identification, counting, one-to-one correspondence, and much more. Zoe's Rainbow makes learning colors, shapes, patterns, and textures fun. Grover's Thinking Cap is a playful way to teach your child critical-thinking and problem-solving skills. Elmo's World is an introduction to science through hands-on play, discovery, and observation. Cookie & Me helps make health and fitness a delicious part of every day. Be a Buddy shows your child what it means to be part of a community. Magical Moments celebrates important milestones in your child’s life. By Phone: Call 1-800-353-3140 (toll-free) Monday to Friday, 9 am–6 pm EST. In Canada, call 1-800-675-6995 (toll-free). By E-mail: CustomerCare@EarlyMoments.com. We will respond within two business days. It's easy to share the gift of reading with your child. We make it easy and affordable to fill your home with wonderful and educational children's books each month. 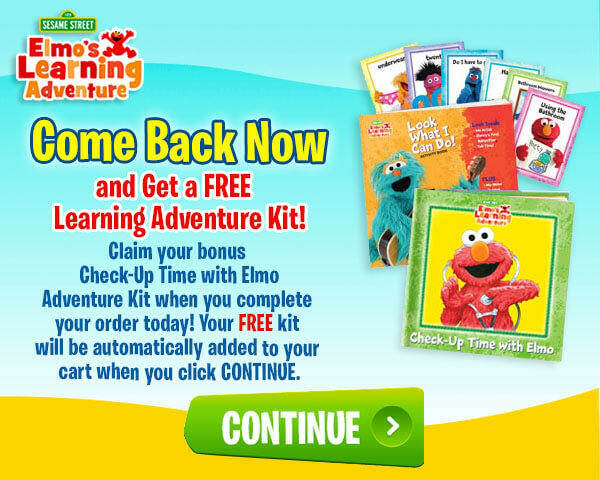 Join the Elmo’s Learning Adventure Subscription today and we'll send you an Introductory Package for just $3.99. Shipping is FREE! 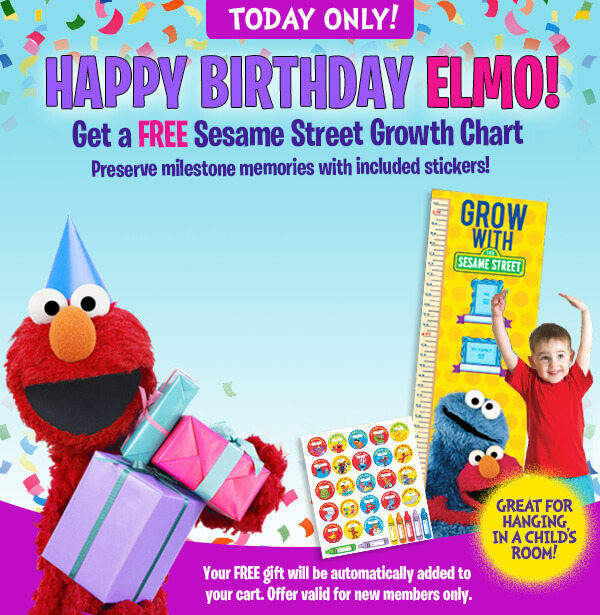 Plus, the Elmo’s Growth chart is yours FREE! Plus... get an extra money-saving bonus. Save even more when you select to receive two additional book sets for just $7.99 – that’s 50% OFF our everyday low price – with no additional shipping and handling! Encourage a lifelong love of reading. 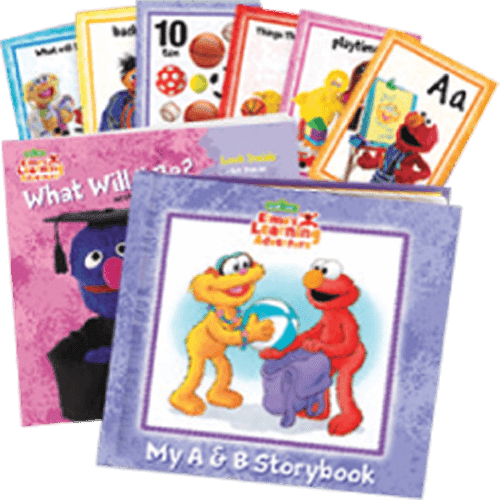 Each month you and your child will benefit from receiving 2 brand-new Elmo’s Learning Adventure kits, each containing a Hardcover Storybook, Activity Book and 6 Adventure Cards. If you decide to keep them, they are yours for just $7.99 per kit plus $3.99 shipping and handling. Your complete satisfaction is guaranteed. If for any reason the books in your Welcome Package don't delight you or your little one, simply return them to us at your expense with a note marked "cancel." We'll gladly refund the purchase price, no questions asked, and your subscription will be cancelled. Any free items you received as part of your Welcome Package are truly yours to keep with our thanks for giving the subscription a try. You may cancel your subscription at any time, for any reason, and keep all of the books that you’ve purchased—including those in the Welcome Package. There is no purchase commitment. Your exclusive subscription benefits allow you to return any book package that does not delight you within 30 days of its original ship date. Use the simple instructions within the shipment to return the package at your expense, and we'll refund the purchase price, less shipping and handling. Exclusive FREE preview privileges. 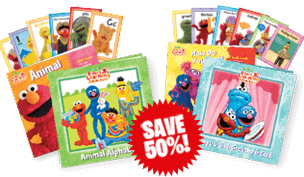 Once you have received two shipments of your Elmo’s Learning Adventure Subscription, you will also be automatically enrolled in our separate Free Preview Program to receive, up to four times a year, 7-day free previews of special shipments of selected items to complement your subscription. We will always notify you by email before we send anything. That email will contain a detailed product description, offer details, price (usually about $15.00 plus shipping and handling), and clear instructions for how to reply. Simply tell us within 10 days by phone, mail, email or by visiting your MyPage at www.EarlyMoments.com if you choose not to receive the package announced, or do nothing and it will be sent. As always, your satisfaction is guaranteed and if you do not wish to keep any preview package you receive, you may return it at our expense. You may cancel your Free Preview subscription at any time. Subscription and Free Preview accounts must be canceled separately; see Free Preview invoice for cancellation instructions. 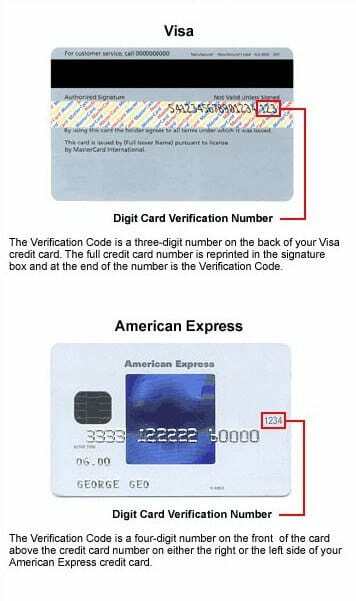 Other qualification details and important information: You must be 18 years of age or older to order and all orders are subject to approval. Limit one per household. Out-of-stock titles and free items may be replaced by alternate selections. For your convenience, please note that the Welcome Package, all future subscription shipments and Free Preview shipments will be charged to the credit card you provided at sign-up. Sales tax will be added for subscribers in CT, PA and IL. Please pay on time. A late charge of $2.49 per notice will be added to overdue payments to help cover the cost of sending recurring bills. Overpayments on cancelled accounts are subject to a $1 per month fee. Future contact may include e-mail if your account is overdue. Subscribers may occasionally receive information on products, services, special deals, and e-newsletters. If you no longer wish to receive any marketing or promotional materials from us or our partners you may opt-out of receiving these communications using the link located on the bottom of all such promotional e-mails. Elmo © 2019 Sesame Workshop. All Rights Reserved.